Published in The Drawing Papers #67, as part of the Levity: Spring Selections, 2007 Group Exhibition at the Drawing Center, New York. My recent drawings have evolved out of the process of working on temporary installations. These site-responsive projects enveloped the viewer within rectilinear fields of color, sharp edges of taped lines, and references to the history of architecture. Each project created elastic environments that integrated the viewer’s shifting perspective. These analytic and intuitive installations proposed a coincidence between the physical facts of the site and the viewer’s interaction with them. My new drawings continue to explore this intuitive superimposition of spaces retuned by the possibilities of the page and the hand. Instead of guiding the viewer around a given room with trajectories of colored planes, these works on paper employ a mixture of abstract patterns and deliberate imagery to suggest, as well as chart, multiple paths across the page. 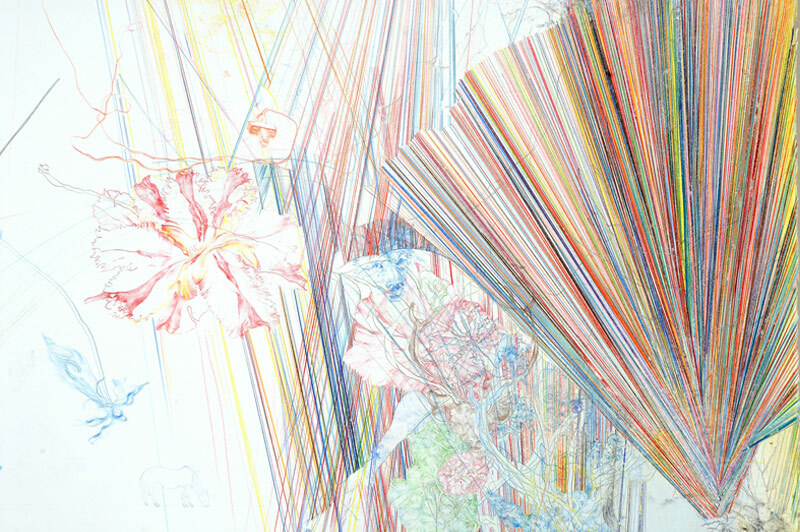 Rendered with colored pencil, they compass a range of pictorial and graphic languages that flirt with a kind of over-telling. The scale of the largest drawings suggests that of walls: their accumulations of colored line and passages of wash-like tints mesh in and out of focus. This allows them to be read atmospherically from a distance. At close range, the layered hand-drawn imagery comes into view at different speeds. Drawn softly at first, the details of these discrete vignettes build from pieces of my everyday life to achieve a precision and abundance that resembles a form of truth. The act of drawing guides my search towards a new narrative. Since these detailed depictions require time to absorb, they also slow down the process of looking. With its apparent lack of hierarchy, multiple perspectives, and shifts in scale, each drawing becomes a theater of space mirroring the distracted state of memory and daydreams. They navigate an escape to a place where the mundane journey merges with the mythic narrative. I draw to document important moments in my life. I map cause and effect relationships that capture and combine elements of fantasy and reality, of wonder and practicality. With handmade images, graphic patterns, and veils of space, I define and locate myself in time and place. First, I make a “punch” to elicit a visual and visceral response from the spectator. Then, I work on the relationships of scale and intensity of the details, which pull viewers in and surround them. Finally, I chart space and time with images and graphic symbols that are handmade and varied in touch. As if keeping a diary, I list and follow events in my everyday life. I draw, erase, redraw, erase, and then keep drawing from the ghost image erasure until I see a connection between mark and meaning. For reflection, I leave the paper up for as long as it takes to complete the drawing. As viewers engage with the work, they can combine the images and graphic elements in any way, in order that makes sense to them. Because the drawings are basically stream-of-consciousness narration, I expect the viewer to combine the images and marks in a unique way, in his or her own fashion.